Passenger Pigeon Press collaborates with artists working in all disciplines who pursue paths that are not popularized by the mainstream. ON SATURDAY, SEPTEMBER 29th, 79 INDIVIDUALS OF AFRICAN AND ASIAN IDENTITIES WILL GATHER IN AT THE EATON DC, IN WASHINGTON DC TO DENOUNCE RACISM, COLONIALISM, AND NUCLEAR WAR! In April 1955, twenty-nine Asian and African countries gathered in Bandung, Indonesia to take stock of the geopolitical dynamics at the time, and to forge a new coalition denouncing racism, colonialism and nuclear war. Over sixty years later, the Bandung Conference remains an overlooked historical artifact, but its themes, achievements, and shortcomings still reverberate today. To honor and reflect on the intricate connections between past and present, NY- and DC-based scholars and artists began The Color Curtain Project, a series of dinner parties and art book presentations that convene individuals of African- and Asian-American identities for constructive dialogue. Named after Richard Wright's reporting on the Bandung Conference, The Color Curtain Project encourages participants to break bread and candidly discuss political and social justice challenges that entwine the contemporary Afro-Asian-American experience. Pre-order The Color Curtain Project Artist Book Experience which will include the invitation, artist book, and photo album enclosed in a box. All of the money for these sales will go towards the next iteration of The Color Curtain Project. Your order will be completed in Spring 2019. Pre-Order The Color Curtain Project Artist Book Experience which includes the invitation, artist book, and photo album enclosed in a box. Your artist book experience will arrive in Spring 2019. This is a box of pictures, data, poems, and memos from Vietnamese refugee camps with new poetry by Patricia Nguyen. The candle can be lit to create shadows from the past. we leap out to sea. Patricia Nguyen is an artist, educator, and scholar born and raised in Chicago, Illinois. She has a Ph.D. candidate in Performance Studies from Northwestern University. Her research and performance work examines critical refugee studies, political economy, oral histories, inherited trauma, torture, and nation-building in the United States and Vietnam. She is co-founder and executive director of Axis Lab, a community centered art, food, and design studio based in Uptown, Chicago that focuses on equitable development for the Southeast Asian Community. Seasonal Ruminations on Love is a collaboration between artists Genevieve Erin O'Brien and Tammy Nguyen. 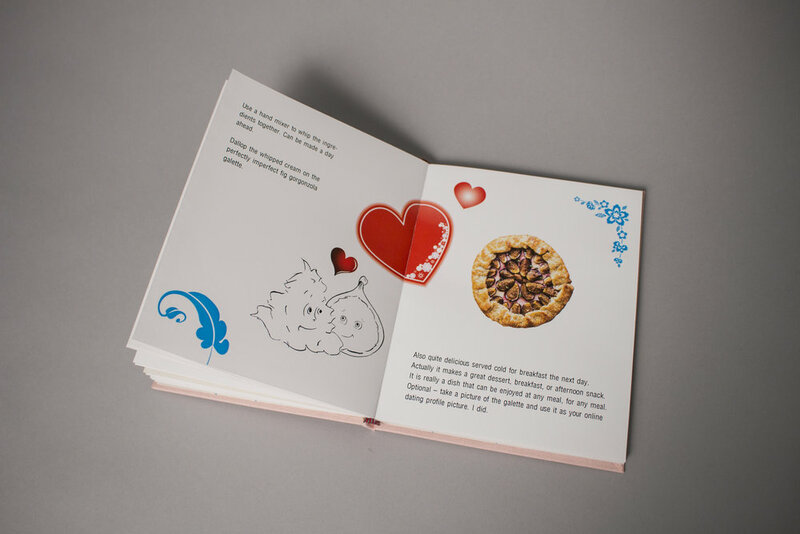 The book incorporates O'brien's recipes for various foods made for different "seasons" of love: Heartbreak, Winter, Seduction, and Monsoon Season. 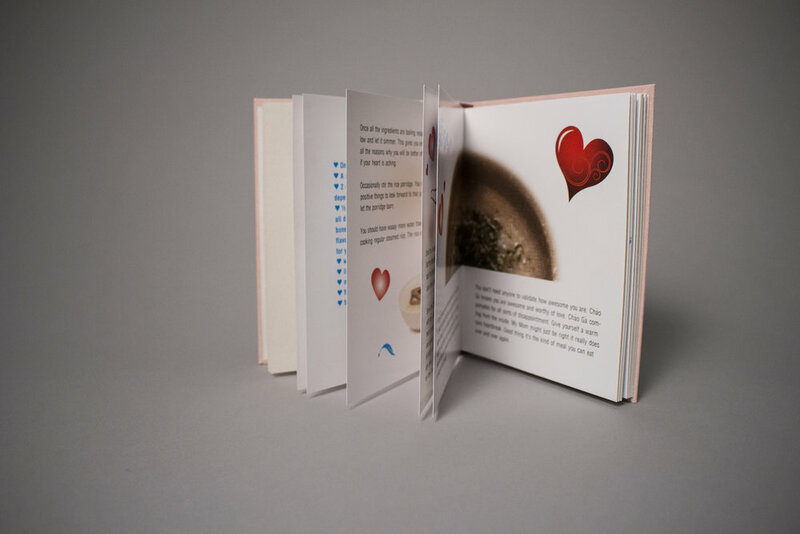 Nguyen took O'brien's writing and interpreted through design inspired by menus and cookbooks from Vietnam. Genevieve Erin O'Brien is a Queer mixed race Vietnamese/Irish/German/American woman. She is an artist, a filmmaker, an organizer, a cook/private chef, and an educator who lives and works in Los Angeles. O'Brien has spent 20+ years working with and organizing in communities for social justice. She was a founding member of Arts In Action, a Los Angeles political arts collective. She holds an MFA in Performance from the School of the Art Institute of Chicago. O'Brien was a Fulbright Fellow in Vietnam, a recipient of the Department of Cultural Affairs, City of Los Angeles and Center for Cultural Innovation's Creative Economic Development Fund. In 2016 she went to Hanoi, Vietnam as a US Dept. of State/ZERO1 American Arts Incubator Artist for a project highlighting LGBTQ visibility and equality. Her newest work More Than Love on the Horizon: West Coast Remix and Sugar Rebels were recently commissioned and presented by the Smithsonian Asian Pacific American Center. Mojiganga, pronounced mo-hee-gahn-gah, is a Spanish word. In a dictionary, the first definition of it reads: Fiesta en la que los participantes llevaban disfraces o máscaras grotescas, especialmente de animales. In English, this translates to: Party in which the participants wear disguises or grotesque masks, especially of animals. 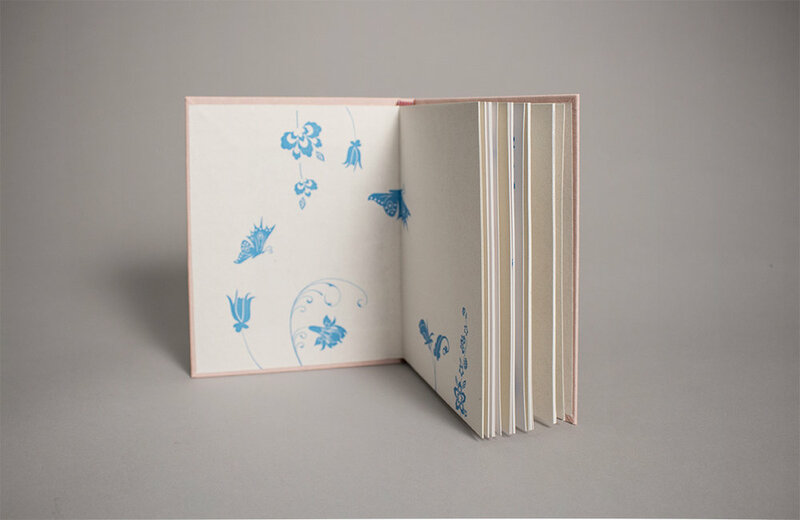 In this artist book, Kenny Rivero wanted to make a quiet book that would allow himself to see the drawings as a viewer. His images are accompanied with the poem When You Were Red by Rocio Peña who described her connection to her family through an object, which the reader later realizes is an old photograph that has aged and thus… tinted red. Kenny Rivero was born and raised in Washington Heights, New York City. He received a BFA from the School of Visual Arts in 2006 and an MFA from the Yale University School of Art in 2012. He has received numerous awards including the Doonesbury Award, the Robert Schoelkopf Memorial Travel Grant, and the Rema Hort Mann Foundation Emerging Artist Grant. He has exhibited at the Pera Museum in Turkey, the Stedelijk Museum in the Netherlands, the Contemporary Art Museum in St Louis, The Sugar Hill Children’s Museum of Art and Storytelling in New York City, and El Museo del Barrio in New York City. In this work, Tran Minh Duc intervenes with old found maps of the East-coast to Mid-west sections of the United States. He has folded the map into a booklet format. As the reader opens the book, they are met with pink depictions of Ho Chi Minh and the Statue of Liberty, both similarly represented by a salutary pose. On the back side of Ho Chi Minh is the preamble to the United States’ Declaration of Independence. The back side of the Statue of Liberty is the preamble to the Vietnam’s Proclamation of Independence. Both these sentences could be translations of each other since the Vietnamese statement was partly modeled from the French Declaration of the Rights of Man, which was modeled from the American Declaration of Independence. Glimmering throughout this map-booklet are grammatically incorrect pink stamps of the phrase, “Happiness to everyone.” In this way, the reader is probed to unfold the entire map where they will find the slogan stamped on every state. Tran Minh Duc frequently uses pink in his work. Pink refers to Agent Pink— the most potent of chemical weapons released by the US Army during the Vietnam War. It is also the color of the Apple Snails’ eggs— an invasive species of snails in Vietnam. Finally, the word for pink is “hong” in Vietnamese, but when translated into Chinese— it means “red.” Tran Minh Duc’s art encompasses performance, photography, collage, video and installation. He has participated in numerous artist-in-residency programs in Japan, Paris France, NYC USA and Myanmar. He currently lives and works in Ho Chi Minh City, Vietnam. This package includes a print of an abstract field, an orange sheet of vinyl stickers and a list of rules. Ronny Quevedo invites people to explore this varied edition by placing the stickers onto his field. This collaborative game incorporates James Naismith’s original thirteen rules of basketball. Here, though, Quevedo has altered Naismith’s rules to reflect how basketball players from marginalized communities have changed the rules of the game. Quevedo’s method of altering these rules are inspired by Edouard Glissant’s “Poetics of Relation”, which suggests that peripheral identities have a major impact on what is central or standard. In this spirit, the reader’s sticker-interaction mimes the changing of rules and ultimately culture, over time. Ronny Quevedo’s artistic practice is an examination of the vernacular languages and aesthetic forms generated by displacement, migration, and resilience. Inspired by his own family history and migration, Quevedo transcribes the graphics of locality, community, and remembered environments directly into his work. He has been exhibited nationally and internationally at The Drawing Center; the Queens Museum; The Bronx Museum of the Arts; Museum of Fine Arts, Houston; and Emerson Gallery (Germany), amongst others. He is a recipient of a 2017 Blade of Grass Fellowship and 2016 Queens Museum/Jerome Foundation Fellowship for Emerging Artists. He has participated in residencies at the Lower Manhattan Cultural Council, Kala Art Institute, the Core Program at the Museum of Fine Arts, Houston, Project Row Houses, Skowhegan School of Painting & Sculpture, and Lower East Side Printshop. Didier William is originally from Port-au-prince Haiti. He received his BFA in painting from The Maryland Institute College of Art and an MFA in painting and printmaking from Yale University School of Art. His work has been exhibited at the Bronx Museum of Art, The Fraenkel Gallery, Frederick and Freiser Gallery, and Gallery Schuster in Berlin. He was an artist in residence at the Marie Walsh Sharpe Art Foundation in Brooklyn, NY and has taught at Yale School of Art, Vassar College, Columbia University, and SUNY Purchase. He currently lives and works in Philadelphia PA, where he serves as the Chair of the MFA Program at the Pennsylvania Academy of the Fine Arts. Originally created for a stop-motion animation, Meena Hasan’s two-dimensional letter-pressed puppet was inspired by an American myth. According to this story, Benjamin Franklin wanted the national bird to be a turkey instead of an eagle due to its higher moral character and authentic nativity. This puppet is both a turkey and an eagle and by its moveable parts, you can play with its internal quarrel. It is printed on 2-ply museum board and BFK white 300 gsm. The decorative background paper varies with each edition. Dimensions are 10” x 10”. Meena Hasan is a visual artist born in 1987 and raised in New York City. She received her B.A. in Studio Art from Oberlin College in 2009 and has exhibited in Ohio, New York City, Rhode Island, Rome, Shanghai, New Haven, CT and the Netherlands. In 2010, she completed the Terna Prize Affiliated Fellowship at the American Academy in Rome. Meena graduated from Yale School of Art's Class of 2013 with an MFA in Painting and Printmaking and the Carol Schlosberg Memorial Prize for Painting. She currently lives and works in Brooklyn, NY.